Across a wide range of consumer devices, from cameras to smartphones to laptops, flash storage has become the de facto standard for digital data storage. Because of its relative compactness, speed and low power consumption, flash storage also has experienced dramatic growth in enterprise data storage solutions. While initial use cases were somewhat limited, flash storage in the enterprise has expanded in many areas, which in no small way is related to the cost of flash storage dropping more than 80% in the past five years. Compared to spinning disk systems (HDDs), enterprise systems using flash can use fewer storage devices to deliver comparable performance levels and require less cooling, simply because they have fewer moving parts. Consolidating storage like this allows enterprises to reduce power usage costs, maintenance costs and other costs as well. Unfortunately, many enterprises miss out on these savings because they still rely on acquisition cost as the deciding factor when looking at storage solutions. Even with the incredible drops in acquisition costs of flash storage, it still can run five times more than HDD solutions, which can seem attractive when acquisition cost is the only consideration. However, if you look at the Total Cost of Ownership (TCO) as a sum of the initial capital layout for a storage solution, plus all the other costs associated with the full lifecycle of the storage solution, industry studies agree that acquisition costs account for only about 20% of TCO. Other lifecycle costs like performance, power usage, reliability, maintenance and various factors, account for the other 80% of TCO, so it is important to consider those factors in a buying decision for any storage solution. Let’s take a quick look at some of the costs that make up 80% of your TCO. Maintenance and repair costs are probably the most obvious in your TCO. HDDs have a failure rate of anywhere from 2-8%, meaning that every year, you can expect to lose one drive for every 12 deployed. That is significant, especially when you consider that the cost to replace a failed drive includes system down-time and labor to replace the drive, in addition to the cost of the replacement drive itself. When it comes to power costs, consider the fact that flash storage has no moving parts, while disk drives have motors that keep the disk spinning and read/write heads that constantly move across the surface of the disk, and it becomes obvious why flash storage solutions consume a lot less power. Because they have no moving parts, they not only draw less power, but they also create less heat, which translates into lower cooling costs. 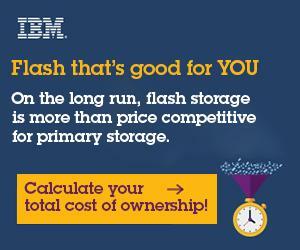 In fact, in some storage solutions, flash is up to 80% more energy-efficient than comparable HDD solutions. By now, you get the point that there are many other factors to consider in your cost evaluation of flash storage solutions versus HDDs. Although the task of calculation all the factors that make up the storage lifecycle costs may seem a bit daunting, the Storage Networking Industry Association (SNIA) offers a very nice TCO calculator tool that makes easy work of doing a TCO calculation for your next purchase. You can download the tool for free at https://www.snia.org/forums/sssi/programs/TCOcalc. This free tool will take you through a simple, five-step process where you answer questions about the configuration of your current or planned storage system, along with costs and specs of both flash and HDD solutions. And, as a nice little training help, the tool comes loaded with sample data to help you see how it works. Although the initial price of flash storage remains at about five times the price of HDD storage, flash is most likely a better investment when you look at the TCO. When you consider maintenance, power usage, reliability and all the other factors that make up the TCO, it quickly will become obvious that flash is the better choice for the long term. Either way, it’s always a good idea to give your capital outlays as much due diligence as possible. Special thanks to IBM for sponsoring this blog, a series independently written by Linux Journal.